Teaching children to recognize the goodness in others seems to be harder and harder in our society. I don't think it's impossible and I think it begins with teaching them at an early age through example, through our own actions and through things such as reading books. Books provide such an avenue for the young mind and we as adults are the first ones to expose them to the wonderful world of books. 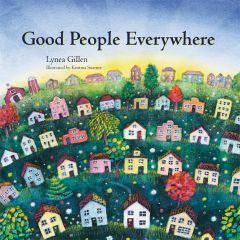 I read a children's book by Lynea Gillen titled Good People Everywhere to my girls. The book illustrates how children can be more aware of other people in the world by providing examples along with bright, vivid illustrations. It helps to show them that they can grow up and be giving people too because there truly are good people everywhere. I think it's a great way to show children how you can give in other ways and how easy it is to be a thoughtful, caring person. It also comes with two activities that help children recognize the good people in our family, friends and communities. 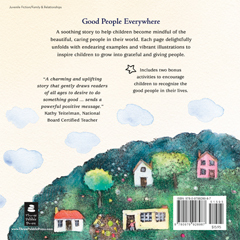 Good People Everywhere is a 32 page, 9" x 9" hardback book. Lynea Gillen has been a teacher and counselor for more than 30 years. She is the creator of Mindful Moments Cards, the DVD Kids Teach Yoga: Flying Eagle, and is the author of Yoga Calm for Children. She lives in Portland, Oregon. Kristina Swarneris the award-winning illustrator of numerous books, including Before You Were Born and Enchanted Lions. She lives in Chicago. *Disclosure: I received a complimentary copy of this book in exchange for my review.